Well, it wasn't humans exactly. Probably our Homo heidelbergensis ancestors lashed the first sharpened rock to a large wooden pole. 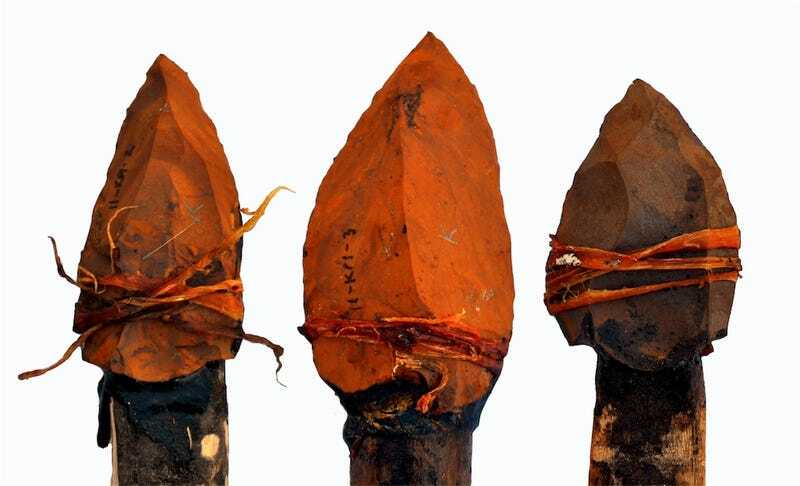 It looks like yet another technological milestone has been pushed back even further into the past, as new research suggests that early humans were making hafted spears and knives an incredible 500,000 years ago. Prior to now, the earliest evidence of hominids attaching stone tools to handles was around 200,000 to 300,000 years ago. However, a group of researchers believe that stone points found at the Kathu Pan 1 site in South Africa may have been the heads of spears some 500,000 years ago. This conclusion comes from several pieces of evidence. The stones' bases show marks consistent with being hafted, and the wear on the edges of the stones matches the typical pattern found on such a weapon. How do scientists know what's typical for such archaic weapons? They've done experimental recreations, constructing similar stone tips, hafting them to dowels, and using a crossbow to fire them into deer carcasses to simulate stone age hunting. Apparently the replica stone tips did a fine job of penetrating the deer's hide, and the marks the used spears matched those on the ancient versions. So yes, half a million years ago, our ancient ancestors had already figured out how to tie pointy things to a stick in order to kill prey from a safe distance. Pretty impressive, when you consider Homo sapiens didn't evolve until about 200,000 years ago.